Includes everything ready to drop in to your favorite Strat® by simply hooking up the hot wire (audio) and ground wires. Includes Fender's 60'th Anniversary Limited Edition 1954 Strat® pickup set, genuine Fender® pickguard, knobs, switch tip along with top quality CTS potentiometers, Orange Drop polyester film tone capacitors and a CRL pickup selector switch. These original Fender #099-2244-000 60'th Anniversary Limited Edition 1954 pickups were replicated from an authentic and original 1954 Strat® for Fender's 60'th anniversary of the Strat®. 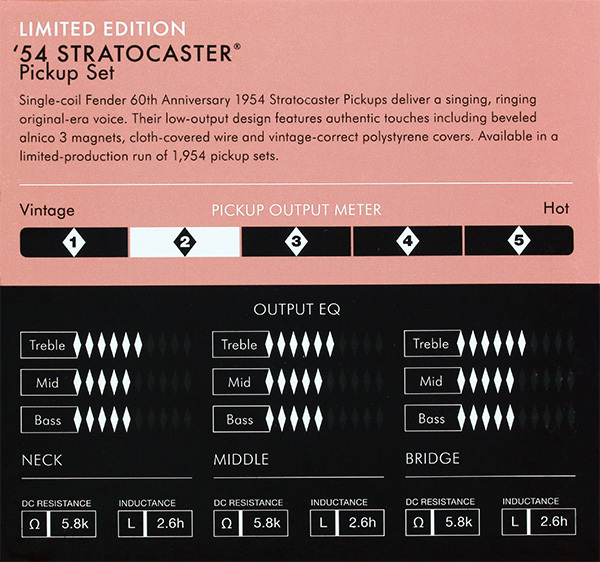 They are only being produced in a limited number of 1,954 sets, so don't hesitate if you are interested in the tone that made music history with the introduction of the Strat® in 1954. We have a limited number of these sets available and once their gone there won't be any more. 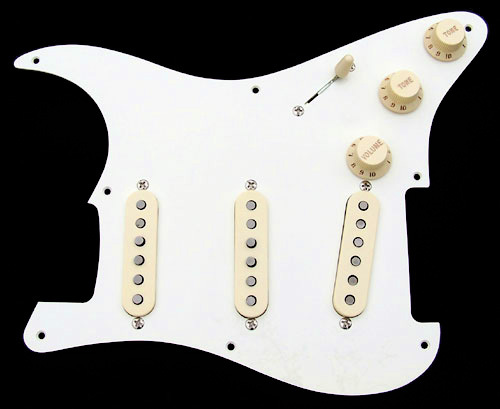 We offer a number of pickguard assembly options to appeal to your particular Strat® body color. 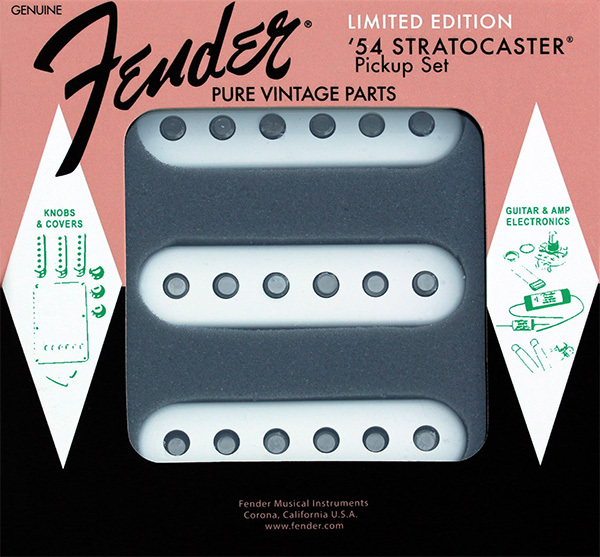 Pickup Set: Genuine Fender® Pure Vintage 60'th Anniversary Limited Edition 1954 Strat. The Fender® Pure Vintage 60'th Anniversary Limited Edition 1954 Strat® pickups are the same pickups installed in the Fender® American Vintage 60'th Anniversary 1954 Stratocaster® guitar which it too was produced in a limited quantity of 1,954 complete Strat's. 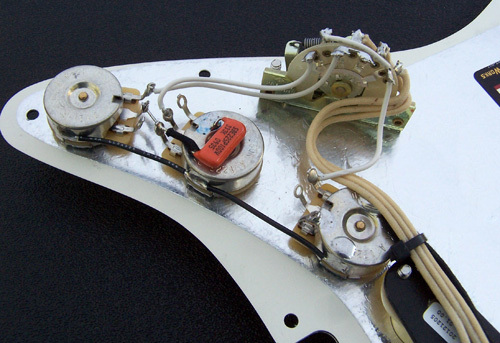 These Fender® 60th Anniversary 1954 Stratocaster® pickups deliver a singing, ringing original-era voice. 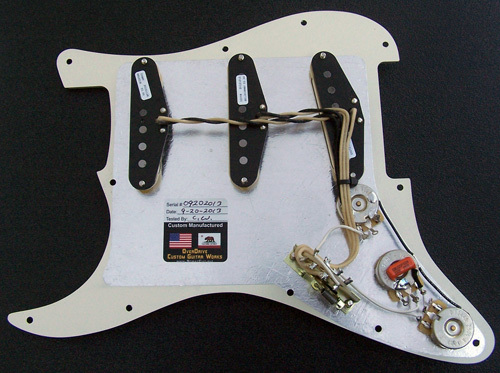 Their low-output design features authentic touches including beveled alnico 3 magnets, cloth-covered wire and vintage-correct polystyrene covers (with white accessory color selection only). Formvar-coated magnet wire adds brightness and glassiness.